Coco Perlite consists of a blend of 70% high-quality desiccated coconut husk (coir) and 30% perlite, making it a reliable and easy to use substrate for hydroponic systems. The RHP certification ensures that the mix of coir and perlite maintains a high level of consistency and quality, is pest and disease free, thoroughly rinsed, pH stabilised, pre-buffered with calcium, and has a very low salt index. Coco Perlite has a good balance between liquid retention and drainage, allowing gardeners to supply nutrient solutions more frequently to ensure the consistency of nutrient profiles. Coco Perlite is an ideal substrate to ensure that nutrients are present and available during plant growth. Nutrifield Coco Perlite is a 70:30 blend of coir and perlite, to create a balance between liquid nutrient retention and drainage, and achieve excellent plant growth. Coir has excellent water retaining properties due to its small particle size, which promotes a high degree of nutrient retention around the root zone. Perlite is a highly porous silica substrate with a large particle size, which does not retain water and thereby promotes drainage. 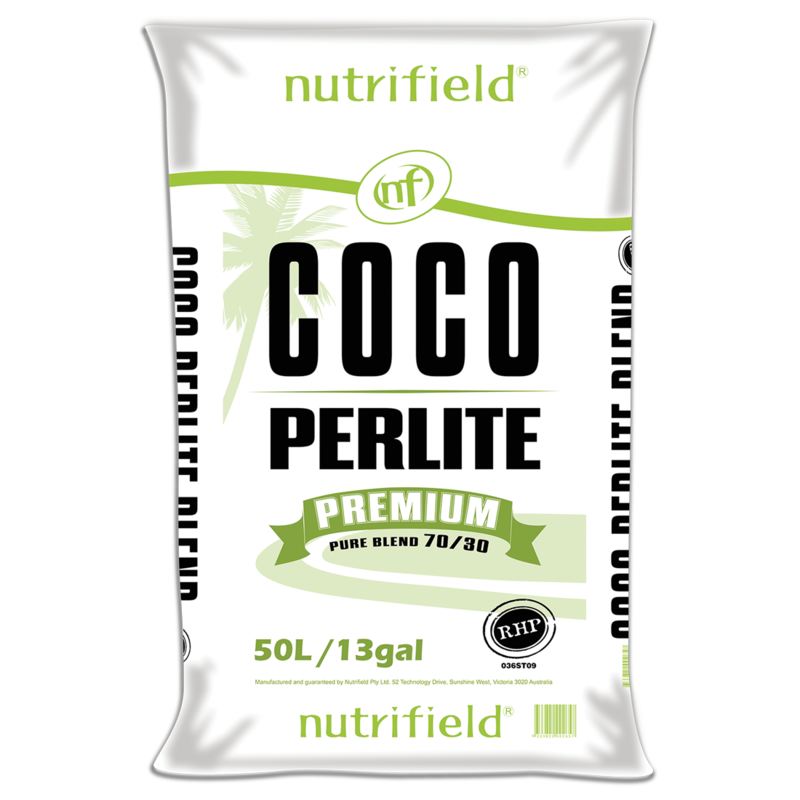 Nutrifield Coco Perlite gives gardeners additional control by allowing them to optimise their setup to match their plant’s needs. The perlite in Nutrifield Coco Perlite provides increased aeration by creating air pockets throughout the substrate. The added airflow inhibits the establishment of anaerobic microbes in the substrate, which tend to be pathogenic. Due to the larger particle size of the perlite, Nutrifield Coco Perlite also resists compacting during transport and storage ensuring that it is free-flowing and ready to use.